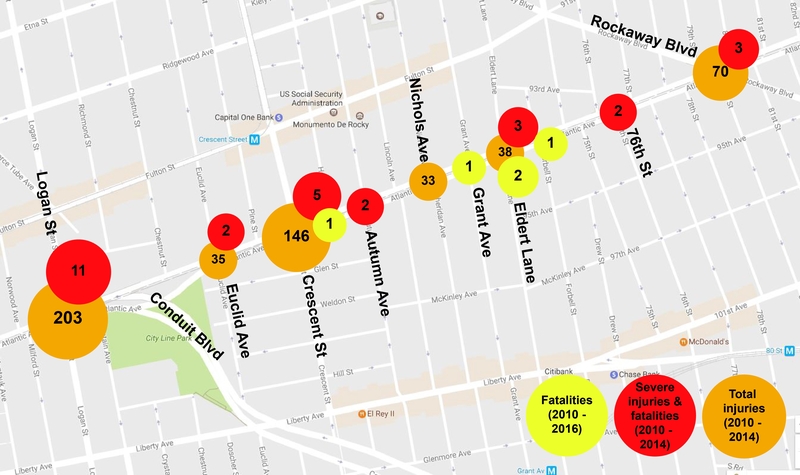 The New York City Department of Transportation is looking to improve safety on Atlantic Avenue between Georgia Ave and Rockaway Blvd. Later this year, NYC DOT will begin construction on improvements from Georgia Avenue to Logan St. Construction between Logan St and Rockaway Blvd will begin in 2018. Safety improvements include: shorter crossing distances, new pedestrian spaces, and traffic calming measures. In addition, trees and greenery will be added to the median to make Atlantic Ave a safe, livable, neighborhood street. There is a pressing need to improve safety on Atlantic Ave and create a safe, walkable street for pedestrians, cyclists, and drivers.